Don't leave! This isn't another question about how to orderby meta_value! 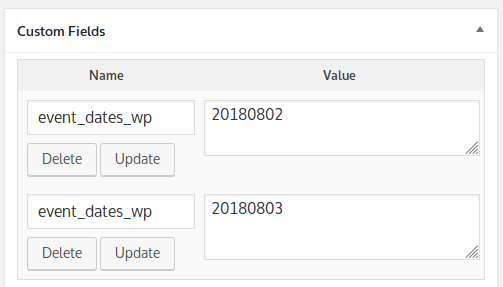 I have a post type called events, and each post I create has a meta field I imaginatively called event_dates_wp which accepts multiple dates and saves them as an array in Ymd format. The above is what one would expect, but what I want to do is list the dates, starting with the 1st of August, all the way through to the 31st, with each matching post listed under each date, allowing them to repeat. The only way I can think to do this would be to query a single date at a time, then moving on to query the next; which can't be a good idea. Is there a way to achieve this seemingly common pattern of querying date based events and formatting them as described? A good example of this kind of behaviour is the Barbican events page, which I believe is using Drupal. There surely must be a WordPress way to do this kind of thing? 1. Get the array of all meta dates your events have. DISTINCT in the MySQL query means do not include duplicates. $result = $wpdb->get_col( $wpdb->prepare( "
2. Loop through all posts having event_dates_wp meta key and get the posts object. You need it once. 3. Compare each post meta to the possible dates you have. If there is match, print it out. 4. Print the post list using print_posts_by_meta_dates() function in a template. 5. Or create the shortcode to use inside the post or page. Not the answer you're looking for? Browse other questions tagged php wp-query date events calendar or ask your own question.